Prowla Sling Bag. The perfect bag for the roving lure angler; it can be carried on your back and swung around the front when access is needed. - Comfortable carry system with extra long, adjustable strap. 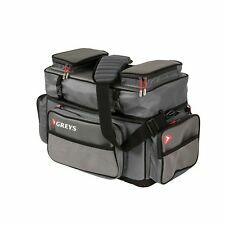 Greys NEW Fishing Bank Bag Fishing Luggage Waterproof Base Fishing Storage Bag. The Duffle Bag is perfect for the travelling angler. Duffle Bag. Images for illustration purposes only. Dim: 600mm x 350mm x 430mm. - Ultra-padded shoulder strap. Prowla Stinger Case. 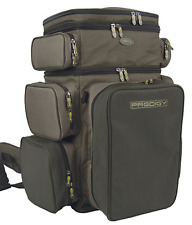 Tailor made to fit Prowla Bags and Rucksacks. Anti snag divider allows maximum storage. 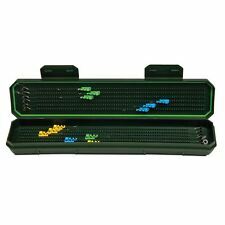 A large number of stingers can be loaded into this case, even when using very large 3/0 trebles. It is slim yet generous and has all the flexibility of storage you might need. It’s for anglers who don’t sit waiting for bites but actively seek them out instead. 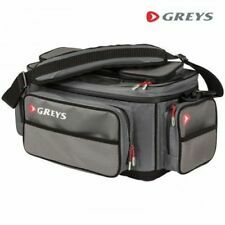 The Greys Bank Bag looks like it fits the bill. PART NUMBER: 1436375 The little brother of the boat bag, the bank bag has everything the roving angler would want in a bank bag. The comfortable shoulder strap makes the bag easy to carry, and the waterproof EVA base will keep your gear dry in wet and muddy conditions.